Tracy O’Connell Novick is a mother of three children in the Worcester Public Schools, a former public school teacher, a certified school business administrator, and longtime education advocate. Professionally, Tracy is a field director with the Massachusetts Association of School Committees, where she manages social media and focuses on school finance. When she found in 2008 with young children in school that local press couldn’t cover all that happened at local Worcester School Committee meetings, Tracy took up blogging on Who’s of Who-cester, inspired by the unheard Whos in the Dr. Seuss classic Horton Hears a Who. 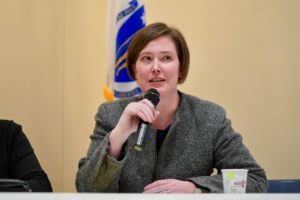 She has since covered Worcester School Committee meetings, Massachusetts Board of Education meetings, Joint Education hearings, and a myriad of other discussions across the state, which she continues to do as a private citizen. During her time on the Worcester School Committee, Tracy lead the creation of a district-wide recess policy of 30 minutes, partnered in greater transparency in district grant spending, and led the intensive study on ways forward in academic excellence steeped in equity in a study of exam schools. Tracy was also active at the state level in advocacy, particularly in equity in school funding. While Tracy left the classroom when she had children, she continues to “presume competence,” believing that public goods like education are far too important for anyone to be left out, and applies this to discussions of school finance, accountability, curricular standards, and regulations.